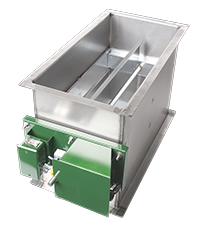 The Zoneflow volume damper from Spring Air Systems controls air flow from individual kitchen exhaust hoods, optimizing energy usage. The ZM model modulates to control hood exhaust flow to match the appliances under the hood that are in use. The ZH model is used to manually balance multiple hoods connected to a single exhaust fan.